Sunday September 28th, 2008 saw the 12th annual Run Around Erie. 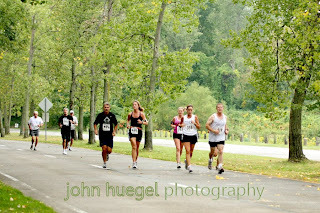 This is a friendly 15k race and non-competitive 5k and 1 mile walk/run. The proceeds benefit Gaudenzia Erie, a substance abuse treatment organization. This is one of Gaudenzia’s larger fund-raising events. With refreshments provided by Tim Horton’s, the morning started out great. This year over 150 runners and walkers turned out. The weather was slightly dreary, but great for running. Temperatures in the mid-60’s, overcast skies, moderate breeze and the smallest touch of drizzle. Kevin Slagle won the 15k with a time of 59:26. That’s quite a pace to set for 9.3 miles! A great awards ceremony including door prizes and some great awards capped off the day. To see the Run Around Erie race photos, check out the main website here, or go directly to the album here. This entry was posted in Gaudenzia Erie, presque isle, Run Around Erie, Tim Horton's by admin. Bookmark the permalink.